May 9 (Bloomberg) — Shanghai’s key stock index slid to a six-year low after the securities regulator picked four companies for a trial sale of state-owned shares in preparation for the disposal of government holdings valued as high as $264 billion. “Investors are concerned the plan will release more shares into the market and cause prices to fall in the short term,” said Zhu Ping, who helps manage $483 million as investment director at GF Securities Co. in Guangzhou. Baoshan Iron & Steel Co. led declines after 1.65 billion of additional shares sold by the company began trading, reducing the government’s holdings and fueling concern that the value of its existing stock will drop. A shares and foreign-currency B shares, fell 28.31, or 2.4 percent, to 1130.83 at the 3 p.m. local time close, the lowest since May 19, 1999. The Shenzhen Composite Index, which tracks the smaller of the two Chinese markets, dropped 9.38, or 3.3 percent, to 274.19, the lowest since Oct. 7, 1996. Both indexes had their biggest declines since Oct. 14. Markets were shut last week for the Labor Week holiday. Shanghai Zi Jiang Enterprise Group Co., Sany Heavy Industry Co., Tsinghua Tongfang Co. and Hebei Jinniu Energy Resources Co. received approval from the China Securities Regulatory Commission for share sales, according to company statements to the Shanghai and Shenzhen exchanges. Trading in their shares was suspended. My friends lost their mony in those two market too. you can extend the range to 2000. The only thing which I can say is waiting and patience, actually nothing we can do. I don’t think now it’s a good time to invest in China as it is near a “cyclical” peak. However, if you put a gun to my head and force me to choose whether to invest in Shanghai properties or the Shanghai stock market, I will choose the Shanghai stock market. Sentiment on the Shanghai stock market is dark and very pessimistic. A lot of bad news have already been discounted. People have “given up” on the stock market and daily trading volume is very low. These are the conditions required for a bottom. On the other hand, everyone and his dog expect properties will keep going up for years after the current “brief” correction. There is still optimism over properties. This is the opposite of the stock market. According to Warren Buffett, the secret to investment success is “To be greedy when others are fearful and to be fearful when others are greedy”. Right now, there is a lot greed in China real estate and a lot of fear and pessimism in stocks. Again I don’t think this is the right time to invest but I will pick Shanghai stocks as the “lesser” of the two evil. My vote is to start buying stocks rather than property too, i think that the revaluation of the yen will do more good for the stocks than the property. The timing of the entry is critical though. a full text rss feed like the one of ur chinese blog’s? I have been investing in the Chinese stock market and will keep doing so. No question about the fact that the Chinese stock market was discouraging during the past several years. No doubt that the road ahead will be bumpy. However, as long as China is manufacturing for the world, I am bullish on its stock markets in a long run – i.e. I believe that long-term investors in China will be paid off. Even during the bear markets in the past years, we could find evidence that supports this kind of bullish view. Here are two examples: first, the stocks of the oversea-shipping sector in China performed well. second, the commodity markets (base matel etc) have been doing very well. You are welcome continue on this object. It’s surprised to read comments on equity market here . 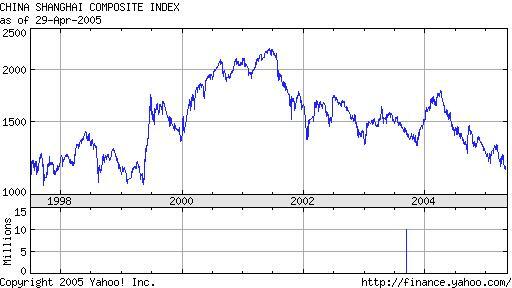 Today , the ShangHai Security Exchange Index breaks 1100 and now remains there , again new low in six years . Here I’d like to say something , as a newcomer entering into the market during bearish session. 1) No low is low enough . SSE index may break 1000, or 800 there won’t be an end . 2) Why so low ? There are always reasons for making a short . The uncertainty of shareholder rights reform deteriorating the looming atmosphere . Some growing sectors reached their peak , as some forecasts say . And the individual investors lose their confidence , which may cost long time to rebuilt again . 3) What is the way out ? So far I have no answer . But my philosophy is , and supported by dozens of tremendous rebounce stories , opportunities exist in mass for those who have discernness and bravery to obtain . Note: the above points represents no constitutional or public view . Rather , I am expressing how I feel in the position of a friend who visited the blog owner once . The contrarian investing style makes sense to me too. I would like to take the current bear markets as the buying opportunities. However, rather than buying into the general markets I think sector and stock picking are the keys. As a new comer (or a comeback guy after 10 years) to the Chinese stock markets, I don’t even want to pretend to be an seasoned person on this issue. Lisa, could you please comment on your “Some growing sectors reached their peak” or direct me to the right places? I’d like to learn more about the fundamentals of different industrial sectors. A word to our host (Jian Shuo Wang): sorry for turning your blog into a forum of a boring topic. Hopefully, it can bring you some extra internet traffic :-). With stock markets that can only trend downwards, the average Chinese investor is limited to few investment choices that have any potential. No wonder real estate keeps trending upwards. Unfortunate that personal outbound investment has been basically forbidden. Imagine what might happen to all those $$ if individuals could invest what they wished to outside of the country. “…after reading your blog…”, whose blog? Can I invest in the shanghai stock market or do you have to be a citzen of China to invest in the shanghai stock market? You can invest in any stocks in China because of your citizenship. The easiest way is to ask one of your friends in China to open an account with local brokers for you. You can also invest in ADR’s in US (which all US brokers will be wiling to do for you), or H-shares of Chinese companies in Hong Kong (SmithBarney can handle this kind of transactions, as far as I know). Blog2read – Go to Blog Search Home. Web Images Video News Maps more » Close menu Blogs …Advanced Blog Search · Preferences. Find blogs onyour favorite topics. Create your own blog and let us promote your post. We arranged blogs and its categories for you to submit post the the relevant blog and its category. a) Why does the intraday chart of Shanghai perfectly mirror that of Shenzhen everyday? Don’t the two exchanges have different stock listings? b) Do “institutions” (sizeable mutual funds, hedge funds etc) participate in the Shanghai market, much like the US? c) Are margin accounts prevalent for retail trading in Shanghai? d) The Shanghai index has already gained 50%+ in the short 5 months this year, with more retail accounts opened than the entire last year. What do you see as THE trigger for a correction? And how soon? Thanks in advance for educating me on your market. I hope to reciprocate by answering any questions you may have about the US market. shareinfoline.com is India’s leading and most comprehensive business and financial information website. The site provides quality information and analysis to its viewers.shareinfoline technical analysts keeps there eyes on this bullish Indian stock market to provide best intraday and long term share market calls daily. Our trading tips covers NSE and BSE.We Provide Recommendations on Indian Shares & Commodities via SMS.We provide recommendations on all NSE,BSE Shares with Short Term view based on Technical Analysis.The Website also provides information on Local & Interantaional News, Celebrity & Celeb News, Glamour World & Entertainment, Gossip Cafe, Believe it Or Not & Much more…..
shareinfoline.com is India’s leading and most comprehensive business and financial information website.The site provides quality information and analysis to its viewers. We Provide Recommendations on Indian Shares (BSE, NSE & F&O) & Commodities. Our Share Tips are given with a view of 8-10 days and we are able to provide 80% result. Our Calls are given based on cash prices. you can take position in Cash as well as F&O. All Share Tips are given via sms and updations are made on website. No Website in India gives complete result of their share tips as “Past Performance” – But we provide complete “Past Performance” of our share calls which you can see in homepage. Do you make these mistakes in trading? Would you like to turn just a small amount of $1000 into $1,000,000.00 in 5 years or less- Guaranteed? Year 2008 was one of the worst year for all people involved in IT sector and in stock market. In past, financial sector and IT sectors were among the major contributor in the country followed by Auto sector. But now these three sectors are struggling to recover from there losses. From investors point of view, we are considering it as an opportunity to make fortunes in Indian stock market. Only thing one has to do is to pick right stock at right time. There are many stocks available in the stock market which can be considered as virgin stock and are ready to blast any time. Now the question arises how to go for stock selection? Which stocks are to be picked and which are to be ignored at these levels. All investors can simply check Research report and can see why to buy or not. I came across this excellent website http://www.source2update.com that shows live indices. and it also shows daily tips for indian stock market cool I love that. This is such a great blog. I have learned so much from it in just an hours reading. I was not aware of the issues in Shanghai at the moment. Keep us posted!! Excellent website!! I have been reading your blog quite a bit recently. You are a great writer. Please take a moment to look at my website. I am coming to Shanghai in October and would love to talk about it with you if you are willing Jian. Get high return NSE and BSE intraday tips, delivery tips and BTST/STBT tips based on technical research. Stocks Basics: What Causes Stock Prices To Change? There are so many people on this earth who invest their money in the stock market. They make a very good research of the stock market and they are finally successful in making a good income. You need to understand the stock basics: what causes stock prices to change? Well there are many factors that are responsible for the change in the stock prices. Well, if you are someone who is very interested in making good profits from the stock market, then you need to be very serious. You should make a good research and also get some share tips from some experts that you know who deals in the stock market. In this way you can get some really useful tips on where to invest and where not to invest so that you get the maximum profit. You should not be in a hurry to invest your money in the market without making a good study of the market. You should understand the concept of different terms that are used in the stock market in order to reap the benefits from the money that you have invested. You should never go for investing your money simply because your friends have suggested in doing so. This would make you go bankrupt as well. etc so that you can have a better idea. You also need to be very careful when you go for online stock trading where you need to provide your credit card details in order to buy or sell your stocks online. So, you need to ensure that you get in hold of a good and genuine website where you can be quite sure to disclose your credit card details. You should also understand how to read the sensex as this would help you to get much knowledge about the stock market. If you are still not sure where to invest in the stock market, then you should get in touch with a good broker who would be able to choose the best one for you depending on your budget as well as your requirement. Being in the professional field for many years they come to understand the stock market scenario where they can guide you to invest in the best shares that would give you the maximum profit out of your invested money, But here too you need to make some considerations like you need to ask your broker about the percentage of commission that he would take per transaction so that you can have a good idea about his fees. You should also get in touch with a genuine broker as there are many brokers who are not educated enough and they waste all your money by investing in the wrong stocks. So you need to be careful in all aspect. You should watch business news in order to know the latest updates in the stock market. This would help you to get the best stocks for you where you need not have to worry about your money getting invested in the right stocks. After all it is your hard earned cash and you cannot let your money go into the wrong hands. So you need to take precautionary steps in order to save your money and also get profits in a very short duration of time. It is best if you can wait for the stock market scenario to get better so that you get the best opportunity to earn good profits. You can also read the daily newspaper where you can get all the updates of the stock market. You should know that the green arrow indicates the rise in the stock price and there is the fall of the prices in the stock market when it is denoted by red arrow. So it is very important that you understand the stock basics: what causes stocks prices to change so that you can be benefited from it. Make sure you invest on the right stocks so that you can remain tensed free and get the best profit from the investment that you have made.